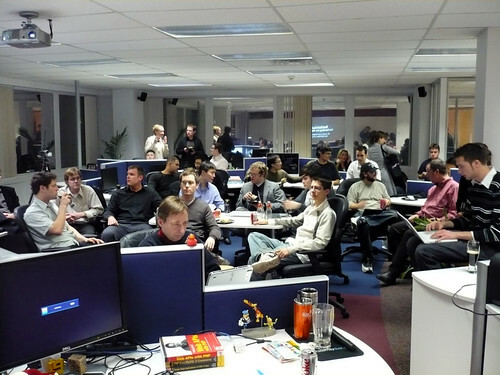 TSOT Ruby/Rails Project Night Next Tuesday! Next Tuesday is the second Tuesday of the month, which means: Ruby/Rails Project Night, hosted by TSOT! Doors open around 5:30 p.m. Presentations begin sometime between 6 – 6:30 p.m. Arrive early to get fed! Ruby/Rails Project Night is a Toronto-area gathering held at the TSOT developer office on the second Tuesday of every month. It’s an event that lets people developing projects in either Ruby or Ruby on Rails show them off in front of their peers in 20-30 minute presentations. Presenters are encouraged to go into as much technical detail as they like (even showing the code, if they’re so inclined) and cover all sorts of aspects of their projects, from programming issues to visual design and usability to the business of making a living off their software. Whether you code in Ruby and Rails for a living like we do, dabble in it in your spare time or are just curious as to what the fuss is all about, we encourage you to come to our office next Tuesday for Ruby/Rails Project Night! It’s a chance for you to see software that’s being developed right here in town and to mingle with other developers interested in Ruby and Rails. We provide food and drink, so you can focus on the presentations and not your grumbling stomach. How to Avoid Hanging Yourself in Rails, by Rowan Hick. This presentation is subtitled “or: Optimizing Your ActiveRecord Associations”. EasyBrandingTools.com: Mike Bowler and Steve Vetzal will talk about their project that helps new businesses be memorable. CRMS – Clinical Research Management System. Luke Galea will present this project, a Rails and Prolog/XSB application that manages drug and procedure trials at some of the biggest hospitals in the U.S..
What Happened at the Last Ruby/Rails Project Night? Check out this article, which has a quick write-up and photos.